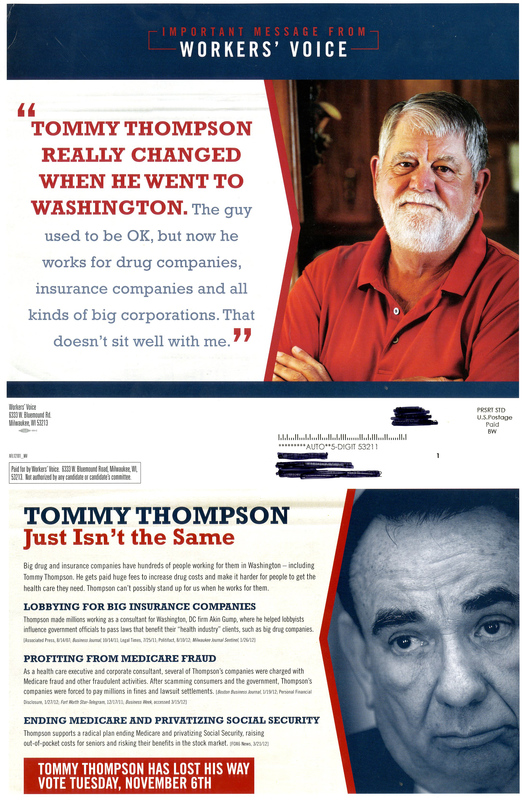 By Dave Umhoefer on Wednesday, October 24th, 2012 at 8:27 p.m.
Campaign fliers mailed by a labor-backed super PAC go after U.S. Senate candidate Tommy Thompson on his plans to try to rein in the cost of entitlement programs before they run out of funds. Under the headline, "Tommy Thompson Just Isn’t the Same," the AFL-CIO’s Workers’ Voice charges: "Thompson supports a radical plan ending Medicare and privatizing Social Security, raising out of pocket costs for seniors and risking their benefits in the stock market." The "end Medicare" claim has long been leveled against Thompson and other Republicans who endorsed the Medicare reforms in U.S. Rep. Paul Ryan’s "Path to Prosperity" budget in 2012. That claim was named the 2011 "Lie of the Year" by Politifact National. On Oct. 17, 2012, we rated an "end Medicare" claim by Ryan congressional opponent Rob Zerban as Pants on Fire. Medicare would still exist under various versions of Ryan’s entitlement plans, though it would move toward a voucher-style system giving beneficiaries a choice of receiving a fixed government subsidy toward a private insurance plan, or for a plan similar to traditional Medicare. But what about the claim that Thompson supports "privatizing Social Security"? A footnote in the ad pointed us to a March 21, 2012 Fox6 TV online story. The story quoted Thompson during the GOP Senate primary, reacting to Ryan’s budget proposal by saying the "next U.S. senator will have to take tough votes to reform programs." Thompson mentioned Medicare and its looming insolvency, but not Social Security. So that certainly does not support the claim by the group. When we asked for further backup, Workers’ Voice spokesman Eddie Vale said the evidence is that Thompson backs the Ryan budget plan. And he said that Ryan’s 2012 budget proposal included privatizing Social Security. We re-read Ryan’s "Path to Prosperity" budget documents. The plan listed there calls for action on keeping Social Security solvent, but it doesn’t endorse any particular approach, including "privatization." We went back to Vale, who this time said that he meant Ryan’s separate, earlier proposal, "A Roadmap for America’s Future." That was issued in 2010, well before Thompson launched his Senate bid and later endorsed Ryan’s Path to Prosperity budget proposal. That proposal did include provisions critics have termed "privatization," as did Ryan proposals in 2004, 2005 and 2007. Offers workers under 55 the option of investing over one-third of their current Social Security taxes into personal retirement accounts, similar to the Thrift Savings Plan available to federal employees. Includes a property right so they can pass on these assets to their heirs, and a guarantee that individuals will not lose a dollar they contribute to their accounts, even after inflation. Makes the program permanently solvent – according to the Congressional Budget Office – by combining a more realistic measure of growth in Social Security’s initial benefits, with an eventual modernization of the retirement age. Vale said those "personal retirement accounts" noted in Ryan’s 2010 plan are behind the campaign flier’s accusation of Thompson supporting "privatizing Social Security." But he offered no evidence that Thompson endorsed the Ryan plan from 2010 or his earlier versions with privatization concepts in them. We couldn’t find any either. The Ryan "Path to Prosperity" budget dropped all mentions of potential privatization, because as PolitiFact noted, he wanted to minimize the chance that Democrats would attack his plan and scotch a chance for a bipartisan deal reforming Social Security. Ryan, the GOP vice presidential nominee, still favors giving younger Americans a choice of investing on their own within Social Security, as he pointed out in the October 2012 debate with Vice President Joe Biden. But the claim we’re evaluating is about Thompson. Thompson has long said Social Security will need reforms to save it, though in the 2012 campaign as emphasized it will not start to "go broke" until 2038, long after Medicare is scheduled to run into trouble. His campaign website praises Ryan’s 2012 budget plan, which Thompson’s site says "makes Social Security solvent" -- though, as we noted, it does not explain how. The only Social Security-related proposal we could find by Thompson in the campaign was his repeal of federal taxation on Social Security benefits. Thompson’s website says, "he will make the repeal budget-neutral by adjusting benefit costs for high-income individuals … The result will be that most Social Security beneficiaries will see reduced income taxes on the money that was theirs in the first place." Thompson served under President George W. Bush as secretary of Health and Human Services from 2001 through 2004, a time when Bush was developing a proposal to carve out optional private accounts from Social Security. Our search of media accounts found that Thompson was occasionally mentioned in news accounts as involved in helping Bush promote the idea -- something that did not win approval. Nationally, Democrats cite an Oct. 30, 2004, Thompson speech on behalf of Bush’s re-election covered by the Dubuque Telegraph Herald as evidence Thompson backed such accounts. As America's population gets older, there will have to be changes in Medicare and Social Security to keep the programs solvent, he said. In addition to living healthier lives, people should be setting up private retirement accounts and investing in long-term care policies. "Americans have to start taking responsibility for ourselves," Thompson said. So, Thompson used the term "private retirement accounts." But taken with "investing in long-term care policies" and "taking responsibility for ourselves," it’s far from clear he meant people should be allowed to divert their Social Security taxes into private accounts. Based on the wording alone, he may have meant people should set up IRAs and similar accounts with their own savings -- beyond any Social Security payments. One last point: the AFL-CIO flier flatly describes private accounts as "privatization," but it is partial privatization at the most. PolitiFact National gave President Barack Obama a Mostly False in 2010 when he said Republicans were pushing "privatizing Social Security," saying it was a scare tactic by Democrats. The AFL-CIO’s political arm, Workers’ Voice, distributed literature saying that Thompson supports a plan that includes "privatizing Social Security." The union cited two plans. But the 2012 plan included no mention of privatizing Social Security. And we could find no evidence Thompson backed the 2010 plan or the earlier ones. Thompson promoted Bush’s ideas on privatization as a member of his cabinet until 2004. But that circumstantial evidence, no matter how suggestive, doesn’t help prove this very specific claim that Thompson endorsed a Ryan plan that touted private accounts. Based on what we know now, we rate the claim False. Published: Wednesday, October 24th, 2012 at 8:27 p.m.